Gosh, isn’t it satisfying to watch the man who spent years questioning whether or not President Obama was born in the U. S. (he was) and was eligible for the Presidency (he was) now the object of a legitimate questioning of how unsullied was his election (it wasn’t). Donnie rose to fame by claiming Obama was born, well, somewhere other than the United States and even after it was conclusively shown that this was not the case, Trumpie persisted in claiming it was because, well facts don’t matter to Donnie. Now that Trump is on the receiving end of this, properly so given the overwhelming evidence Russia interfered with the election and the conclusion of intelligence and law enforcement agencies that this was the case, suddenly questioning an election is out of bounds? Chief Sycophant Mike Pence thinks so. "Donald Trump won this election fair and square," Pence told host Chris Wallace on "Fox News Sunday." 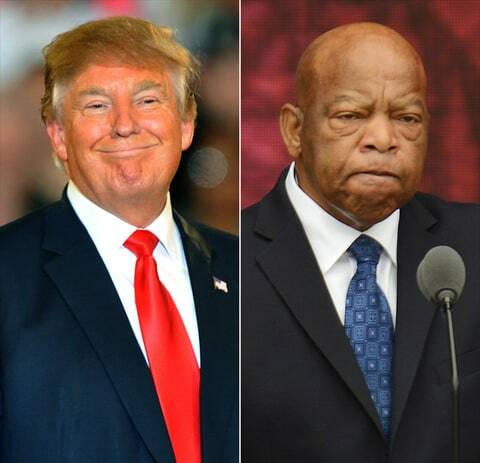 "The American people know that, and while I have great respect for John Lewis and his contributions, particularly with the civil rights movement, I was deeply disappointed to see someone of his stature question the legitimacy of Donald Trump’s election as president and say he’s not attending the inauguration." Gosh Republicans, you know your outrage would be a lot more credible if you hadn’t spent the last 8 years denying the legitimacy of Barack Obama. But that would have required intellectual honesty, wouldn’t it, something you are just not capable of. The return of this site is the only good thing to come out of Trump's election. I'm glad you're back.